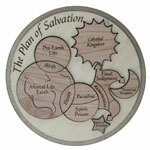 The Plan of Salvation puzzle is a valuable visual aid that illustrates and reinforces gospel principles. 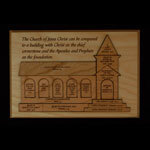 Originally designed as a missionary tool, the puzzle has received rave reviews from missionaries and members throughout the world. Opportunities for its use are unlimited and may include Family Home Evening lessons, Primary and Sunday school lessons. Looking for another language or want to order multiple languages? Click Here! Mark E Peterson’s “17 Points of the True Church” of Jesus Christ shows the components necessary for a church to comply with the scriptural teachings of Jesus Christ as found in the Holy Bible. Now you can illustrate his teachings with this 13 piece puzzle developed with permission from the Church of Jesus Christ of Latter-day Saints. Note: LDSPuzzles is part of GKD Group, INC. Orders and packages will be charged as LDSPuzzles and will be shipped from GKD Group, INC.